A business strike is a coin struck for the purpose of becoming circulating coinage; a coin meant for commerce, rather than for collectors. Coin collectors sometimes forget that the United States Mint was created to make coins that will be used in commerce and support trade. In effect, every facility of The United States Mint is a factory whose primary purpose is to manufacture coins. 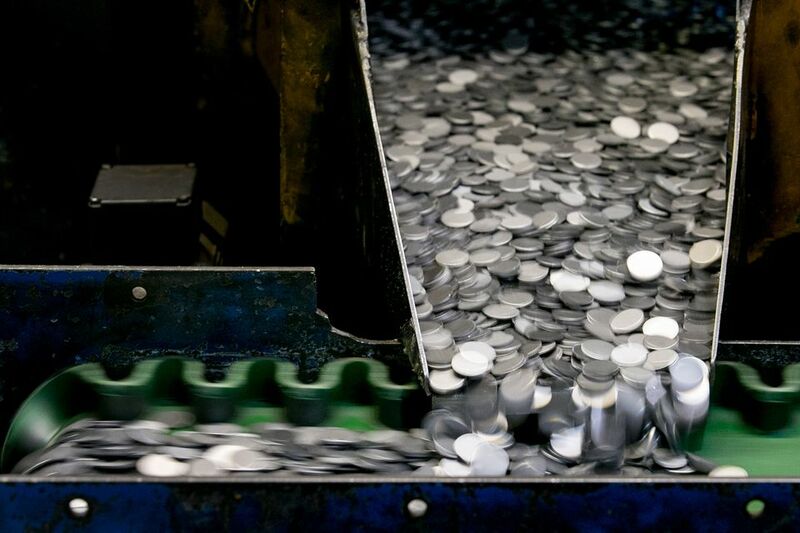 Since The United States Mint produces billions of coins every year, this process is highly automated in order to maintain the highest level of quality while producing tremendous quantities of coins. During this process many materials are moved in bins and bags. This leads to the coins bumping up against each other and leaving marks on the coin surface. Since coin collectors always strive to collect perfect and pristine examples, this modern minting process yields very few perfect coins. Therefore, the mint now produces specially struck and handled coins that are marketed to coin collectors. This includes proof coins, proof sets and special mint strike coins. The United States opened their first minting facility in 1792. Although primitive by today's standards, our fledgling nation now had a facility to produce money to be used in commerce. Most of the process was done manually and the coining presses used the "muscle power" of the operator to strike the coin. Producing special coins for collectors was not a priority for the mint at that time. Over time, the employees of the mint began to produce some specially struck coins on carefully selected planchets and carefully crafted coin dies. These were used as gifts to dignitaries or sold to coin collectors at a premium over face value. There was no formal marketing or distribution channels and coin collectors had to travel to the mint facility in order to purchase them. As time evolved, the mint saw an opportunity to meet coin collector demand and generate a profit for the government. Although the primary mission of the mint is to manufacture coins for commerce, they also take special care in producing coins for collectors. Initially, the mint produced collector coins that were not very different from the circulating coins. However, a collector could tell special care was taken when striking some these coins. Today, The United States Mint produces a variety of coins that are marketed directly to collectors. You can purchase these coins directly from the mint online, over the telephone or through mail order thus eliminating the need to travel to one of the United States Mint facilities. Even though the Morgan Dollar was just a business strike, it was so flawless it looked almost Proof.